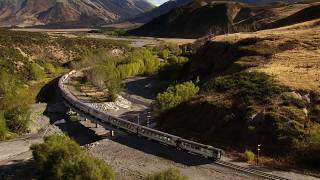 The TranzAlpine scenic train journeys between Christchurch and Greymouth. From the comfort of our carriages, see the fields of the Canterbury Plains and farmland, followed by the spectacular gorges and river valleys of the Waimakariri River. Your train then climbs into the majestic Southern Alps to Arthurs Pass National Park, before descending through lush beech rainforest to the West Coast town of Greymouth – a great base for visits to Punakaiki and the always-popular glaciers. Enjoy all this in the comfort of our carriages featuring huge panoramic windows, an on board licensed café with a range of delicious Kiwi flavours, and GPS triggered at-seat audio commentary.